Creating a merchant site that’s integrated with secure payment processing is elaborate work, and it can be even harder when you want to accommodate customers who prefer making direct payments through their bank. The IBM Open Banking Platform allows just that, quickly and with ease. This application showcases the simple benefits of the payments API of the platform by integrating it with a merchant fashion store. Upon checkout, customers complete purchases by paying directly from their bank account in a safe and secure manner. Imagine you are bank that wants the agility of a digital platform but you are averse to the risks of replacing legacy systems or moving directly to the public cloud. You might be seeking accelerators for your digital transformations, or you may be driven by new regulation and compliance — or perhaps you’re simply on the lookout of opportunities to unlock new digital channels and revenue streams. Your clients want to integrate with direct payments from banks to accommodate customers’ needs while making purchases, securely and easily. The IBM Open Banking Platform is a software-as-a-service suite built on certain predefined industry standards that financial institutions can use to help accelerate their core-to-cloud journey. The store catalog is on display for the customer to peruse and select items they wish to purchase. The cart where all the items that the customer has shown interest in appears for a final review before checking out. After checking out, the customer can select the payment method and complete the purchase by going through the system flow. Create an online store with a catalog of items open to purchase. Build a Node.js web application to interact with the payments API. Customer enters the shopping catalog and places items in the cart to purchase. Customer reviews the cart and proceeds to checkout and pay. A payment initiate request is sent to the IBM Open Banking Platform to start the transaction. 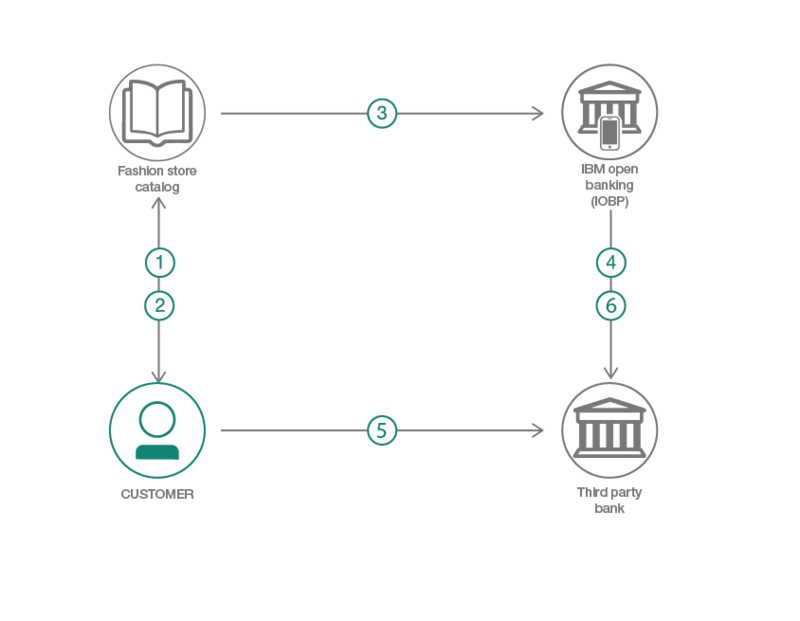 The IBM Open Banking Platform initiates a single payment with the customer’s bank. Customer enters their credentials on the bank authentication page to authorize the transaction. Once successfully authenticated, the payment submission is made from the customer’s account. Getting started with IBM Open Banking Platform This software suite can accelerate a bank’s transformation to a platform economy. This getting started tutorial gives you the list of ASPSPs, and shows you how to set up a single payment and get the payment status. Video: Payment fraud is a worldwide problem Using new cognitive technology, payment fraud professionals can now develop custom models that outperform existing fraud prevention methods. Case study: Borgun Find out how Borgun supports international growth with timely, cost-effective regulatory reporting. Video: Artificial intelligence brings new ways of fighting fraud Explore the challenges banks face around fraud and security and find out why we are seeing such challenges and what can be done to fight back against them. IBM Open Banking Platform enables fast creation of next-generation apps, low-risk innovation, and regulatory compliance.